This article is about operation of solid-fluid separation. For the mathematical concept, see filtration (mathematics). For the equipment used, see Filter (disambiguation). For filtration used in winemaking, see Filtration (wine). Filtration is any of various mechanical, physical or biological operations that separate solids from fluids (liquids or gases) by adding a medium through which only the fluid can pass. The fluid that passes through is called the filtrate. In physical filters oversize solids in the fluid are retained and in biological filters particulates are trapped and ingested and metabolites are retained and removed. 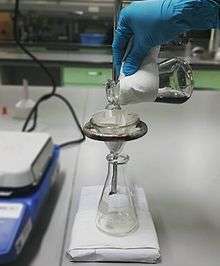 However, the separation is not complete; solids will be contaminated with some fluid and filtrate will contain fine particles (depending on the pore size, filter thickness and biological activity). Filtration occurs both in nature and in engineered systems; there are biologic, geologic, and industrial forms. For example, in animals (including humans), renal filtration removes wastes from the blood, and in water treatment and sewage treatment, undesirable constituents are removed by absorption into a biological film grown on or in the filter medium, as in slow sand filtration. 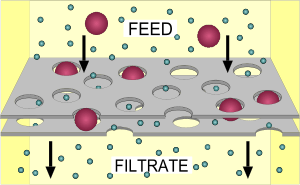 There are several filtration techniques depending on the desired outcome namely, hot, cold and vacuum filtration. Some of the major purposes of getting a desired outcome are, for the removal of impurities from a mixture or, for the isolation of solids from a mixture. Hot filtration method is mainly used to separate solids from a hot solution. This is done in order to prevent crystal formation in the filter funnel and other apparatuses that comes in contact with the solution. 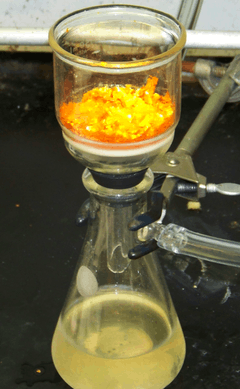 As a result, the apparatus and the solution used are heated in order to prevent the rapid decrease in temperature which in turn, would lead to the crystallization of the solids in the funnel and hinder the filtration process. One of the most important measure to prevent the formation of crystals in the funnel and to undergo effective hot filtration is the use stemless filter funnel. Due to the absence of stem in the filter funnel, there is a decrease in the surface area of contact between the solution and the stem of the filter funnel, hence preventing re-crystallization of solid in the funnel, adversely effecting filtration process. An alternative to filtration is centrifugation — instead of filtering the mixture of solid and liquid particles, the mixture is centrifuged to force the (usually) denser solid to the bottom, where it often forms a firm cake. The liquid above can then be decanted. This method is especially useful for separating solids which do not filter well, such as gelatinous or fine particles. These solids can clog or pass through the filter, respectively. Look up filtration in Wiktionary, the free dictionary. ↑ "Filtration Methods" (PDF). University of Calgary. University of Calgary. Retrieved 4 June 2015.